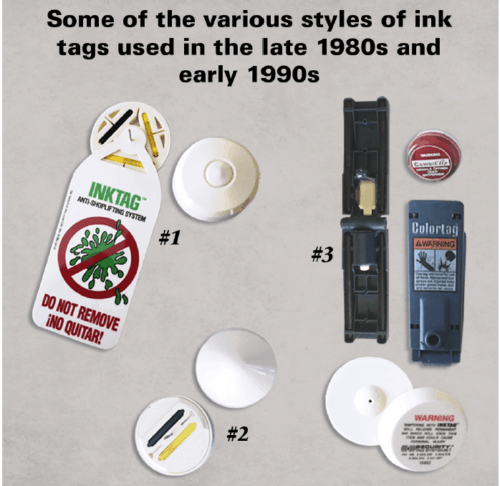 AUTHOR’S NOTE: The year 2019 represents the thirty-fifth birthday of the first “ink tag.” I have had the good fortune to have been immersed in retail and the EAS industry for over four decades. Since I participated in the early days of the benefit-denial phenomenon, I thought it important to chronicle some of the original history. The whole story would be book length—everyone has an ink tag anecdote. Many thanks to the people who contributed, including Jacques Hendrikx, Tom Nicolette, Link Charlot, Jim Wyatt, Natalie Friend, Janet Dennis, Rob Noeth, and Read Hayes. Bravo to all those brave retailers who took the initial risk. The time was around 1990. The preceding passage is a paraphrase of comments made by dozens of US-based retail loss prevention executives after they had been shown an ink tag for the first time. Flash forward to the present day. Ink tags and their derivatives can be seen in almost all stores in which electronic article surveillance (EAS) protects apparel and in many stores without any EAS at all. By the mid 1980s, first-generation EAS products had matured and were losing potency. Shoplifting losses began to rise precipitously. Retailers were realizing that the deterrent qualities of EAS were diminishing to the point where only the rankest of amateur thieves were being stopped. Why? Two main reasons. First, the original microwave, electromagnetic, and radio frequency EAS technologies were old, tired, and easy to defeat. The next-generation acoustomagnetic technology appeared promising, but its reusable tag—pre SuperTag—was easy to defeat, and its disposable label could be emasculated with a “squeeze.” Second, and more importantly, an EAS alarm was no longer a “call to action” to store sales associates, so shoplifters faced little risk of being approached at the door, much less apprehended. The rewards of successful theft had begun to exceed the consequences from the EAS alarm. Decades of experience tells us that thieves routinely steal personal property or retail merchandise either for personal use or to sell for cash. The radical idea behind the ink tag is “benefit denial”—a term coined in 1992 by Read Hayes, PhD, the well-known retail security consultant. Benefit-denial devices provide physical protection that would damage or destroy an item instead of allowing thieves to obtain any utility or economic benefit from it. The certainty that no benefit will be gained by a theft actually creates a better, more lasting form of theft deterrent than with conventional EAS. Exploding dye packs used by banks to identify stolen currency. Cash involved in bank robberies can be readily identified and is less likely to be accepted as a medium of exchange. “Breakaway” electronic switch connectors that disable car radio/CD players if they are removed from the dashboard of the vehicle. Security systems that disable a vehicle’s electronic fuel pump a few seconds after a theft attempt. The Color Tag® (circa 1984). Spawned by the bank dye packs, the first ink-based product designed to protect apparel was introduced in Europe in March 1984 by a Swedish company—Fargklamman AB (also known as Color Tag). The original version had two four-inch long plastic “straps” connected at one end by a hinge. One side housed two pharmaceutical grade vials containing nontoxic but foul-smelling dye, along with two needles to puncture the fabric. The other side housed the receptacles for the needles, along with the lock and the small plastic piston required to open it. They were heavy and expensive (about $6.00 each). 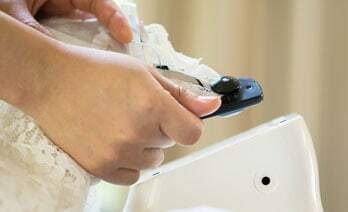 Color Tags were rugged and were able to withstand the rigors of repeated use within retail stores. They were difficult to force open with tools without incident, but the vials didn’t just break, they exploded. When that happened the garment was, indeed, ruined. As with conventional EAS tags, Color Tags were to be removed at the point of sale. A blast of compressed air was needed to push the piston to unlatch the bolt and hook keeping two sides of the tag together. The compressor was not user-friendly. It usurped precious space at the checkout stand, required a dedicated electrical outlet, and cost $800. Kno-Glo™ (circa 1988). Knogo Corporation was the original manufacturer of EAS products. For many years, it was the second-largest EAS company behind Sensormatic Electronics Corporation. Knogo had a large presence in Europe, and management was familiar with the initial success of Color Tag. They decided to design an “ink pin” that could be affixed directly into Knogo’s EAS tags. Their idea was to pour red dye directly into a membrane that was housed in a saucer-shaped plastic cup and then ultrasonically weld on a plastic cover that held the pin for the EAS tag. George Luciano of Clothestime was among the first US users. Converting the idea into a workable product was a challenge. “We had a difficult time welding the two pieces together because of the vibrations,” said Tom Nicolette, Knogo’s former CEO. “The assembly line had sixteen workers, and by the time they finished the shift, they were covered in red dye. It looked as though people were being murdered. We had to install a shower room adjacent to the factory floor.” Even though it was difficult to manufacture, Knogo sold many millions of the Kno-Glo in Europe and then in the US. The Inktag™ and Inkmate™ (circa 1989-93). Security Tag Systems, Inc. (for whom I worked at the time) was a small but visionary manufacturer of EAS and access control products. Among its hallmark products were the world’s first single-pedestal EAS transceiver system and an early RFID system. In the summer of 1989, Brig. Gen. Carter Clarke, Jr., US Army (Retired), the company’s cofounder and president, returned from a European trade show with samples of the Color Tag and ordered our product development people to come up with a rival design as quickly as possible. The Color Tag was virtually unknown in the US at the time. We were skeptical of the idea, but the concept was appealing, so we set to work. We came up with a design for the first version, named Inktag, in the fall of 1989. It was round and about three inches in diameter. The half with the pin held three vials containing gentian violet stain. On the bottom was a warning label. The other half contained a heavy-duty clutch that captivated the pin but did not include an EAS circuit. Unlocking the clutch required a significantly higher-quality rare-earth magnet than had been used up to that time. Our sales force was given handmade working samples to see if they could entice any retailers into a test. The first two early adopters were Pete Schmidt of Bloomingdale’s and Mike Myers of Women’s Specialty Retail. Bloomingdale’s ordered 10,000. I was tasked with testing the initial batch of tags to see if they would “work” properly. I opened the first box and discovered that a few of the tags had leaked in transit. We had sourced the vials from a Chinese manufacturer of Christmas lights. So each unpressurized vial had a round end and a pointed end—where the molten glass had been twisted into a tip. To identify the leaks in subsequent shipments, we placed cotton fabric swatches over the pin to absorb any leakage and identify damaged tags. To minimize breakage, the boxes were rigged with cardboard lattices, so each tag had its own little nest—like eggs in a carton. We promised customers that we would replace any tags that broke in transit. After a rash of complaints about broken tags, we modified the design by switching to pharmaceutical vials with two rounded ends. A much more significant issue was identified with that first batch of tags. The vials wouldn’t break when I tried to pry apart the tags with a screwdriver. If the tags could be defeated without the ruination of the garment, then there would be no lasting deterrent. We were afraid that this fault would be deadly to the entire program, so we convened an emergency meeting to see if we could come up with a solution. The next morning, I arrived at my office to be met by an anxious Dennis Hogan, a mechanical engineer on my staff who had attended the meeting. After spending all night in his home workshop, Dennis offered a solution—a plastic cradle attached to the pin shaft with three stainless steel ball bearings mounted directly touching the vials. Any tampering with the tag would result in the crushing of the vials against the ball bearings along with the releasing of the dye against the garment. Further testing confirmed that the cradle worked. We incorporated the change ASAP. From then on, those bearings were called “Hogan’s balls.” He had developed the first ink tag “breakage mechanism” for which he received a patent. This was our eureka moment. A built-in breakage mechanism was going to be crucial to the success of the deterrent. We never manufactured an Inktag or Inkmate without one. In addition to designing and building high-quality, user-friendly products, we tasked our marketing organization to develop a working definition of the deterrent qualities of the products and a compelling sales pitch that would overcome any objections that we encountered. Since the theory behind the deterrent was brand new and evolving, we decided that publicity would be an important means in creating awareness. We wanted to stimulate demand for the products and educate the public, so they understood the product’s purpose and the reasons why retailers were resorting to such drastic measures. We put out a press release, and an enterprising Associated Press reporter published a small story about the Ink Tag that was picked up by over 400 US newspapers. As a result, we received requests to appear on a number of radio and TV shows. Armed with goggles, an apron, and a screwdriver, I unsuccessfully tampered with Ink Tags and ruined garments on a number of broadcasts, including the Joan Rivers Show. Joan autographed the ruined tee shirt for me, and it hung in my office for years. 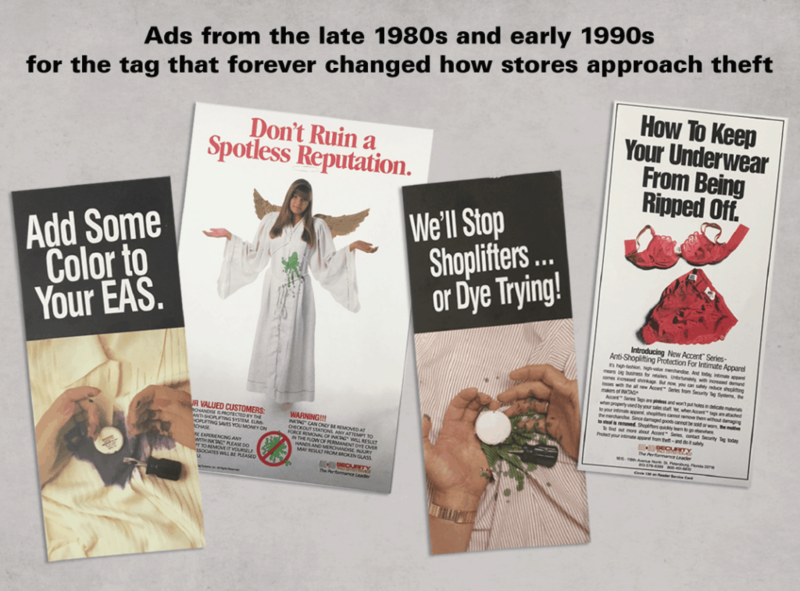 In order to warn shoppers, we offered plastic hangtags, window stickers, trifold rack toppers, and bag stuffers with bilingual warning messages and a picture of a large green ink blot surrounded by the international sign for “don’t do it”—a red circle with a slash through it. “If you turn the tag with the vial side parallel to the floor, you can tamper with the tag, crack the vials, and the ink will simply fall into the bottom,” groused a few customers. So we placed a piece of compressed rubber under the vials. When the vials cracked open, the stress was released on the rubber, and ink was forced onto the garment, no matter which orientation the tag was held. 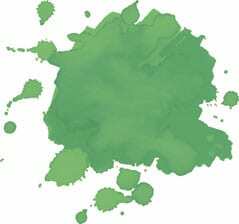 We called that feature a “diffusion pad” and included one with every subsequent ink product. In the first couple of years, we received very large orders from JCPenney and The May Company Department Stores, among many others. After years of obscurity, we were finally on the map. Buoyed by our success, we applied the benefit-denial deterrent concept with locks, rather than ink, to protect other merchandise such as leather goods, jewelry, neckties, eyewear, and swimsuits. The program became so successful that we had almost tripled our business by the time Security Tag was acquired by Sensormatic in 1993. At that time Security Tag was the world’s largest producer and seller of benefit-denial devices. During this time, several other security equipment providers, including ADT/Sensormatic, CombiClip, Checkpoint Systems, Inc., EAS SensorSense (WG), Unisen, and Universal Surveillance Systems got into the benefit-denial business. Through the collective efforts, the terms “ink tag,” “ink pin,” and “benefit-denial device” eventually became part of the retail loss prevention lexicon. According to a 2004 study conducted regularly by a well-known security equipment manufacturer of EAS market penetration among the top twenty-five department store chains in North America, over 68 percent of the branch stores used benefit-denial devices in some form. Only 48 percent of the stores employed EAS (all technologies). By this measure, benefit-denial products had penetrated more department store locations in nineteen years than EAS has penetrated in forty years. What Made the Ink Tag So Important? 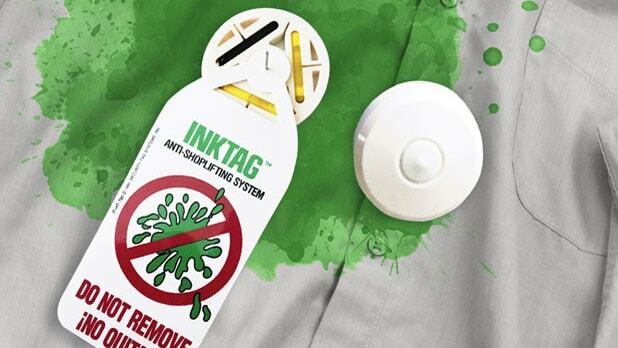 The phenomenon of the ink tag introduced a transformational type of theft deterrence—benefit denial. As long as the security devices cannot be defeated before the protected merchandise is damaged or disabled, then benefit denial is a more powerful and permanent “capable guardian” of merchandise than anything else available. Secondarily, the original introduction of ink pins like Kno-Glo, CombiClip®, and Inkmate allowed EAS users to add the power of benefit denial to reinforce the deterrent. Loss prevention executives realized that the combination of EAS and benefit denial forced the thief to “do something” with the tag inside the store or run the risk, however insignificant, that the alarm would cause a problem as they left the store. My ringside seat provided an opportunity to witness a few transformational security initiatives, such as EAS, dome-oriented video monitoring, and benefit-denial devices. The ink tag saga is my all-time favorite.